Camping Alpes Dauphiné campsite close to Gap ! 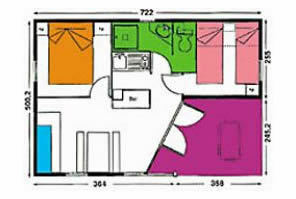 1 bedroom: 2 single beds (80x190cm). The Camping Alpes Dauphiné welcomes you in an environment rich in flowers and vegetation: 6 acres of shady meadow with 185 campsite pitches , renting of chalets, mobile-homes, bungalows et gites.